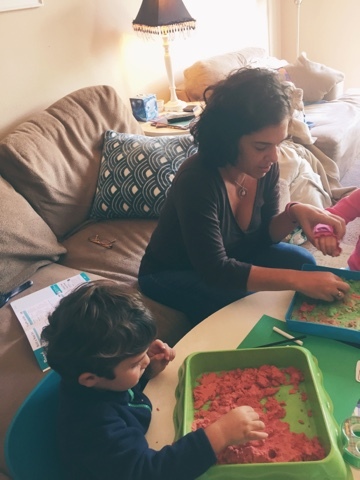 Tiny Toes in SoCal Sand: On The Go with Mother Goose Time! 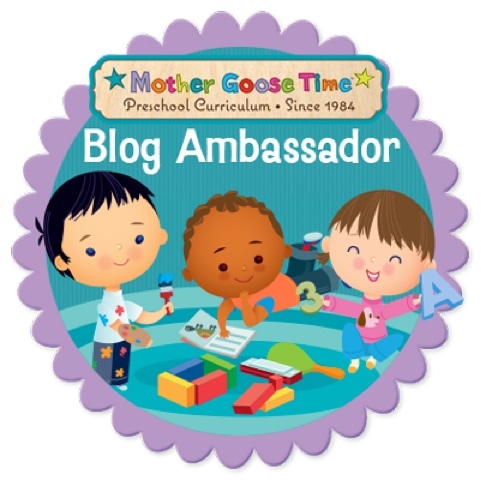 On The Go with Mother Goose Time! I'm finding that the beginning of the month always brings excitement while using Mother Goose Time curriculum! 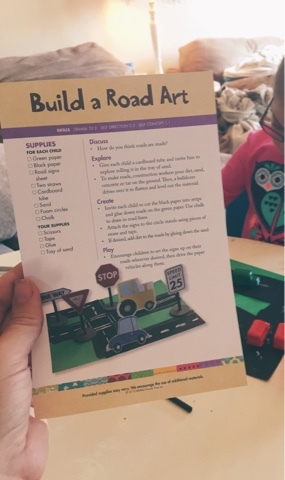 We finished our Orchards theme and we began the On The Go theme for the month, in which we'll learn about streets, maps, road signs, bridges, and methods of transportation. I must admit that I wasn't completely excited about this month until I opened our box. As I pulled out each day's curriculum, I saw the amazing projects and games, and my mind quickly changed. 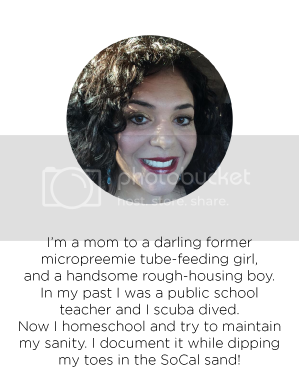 This month I'll be doing things a bit differently, as my three year-old son is very interested in all things transportation, so I will be focusing on the Math and More and Literacy and More workbooks (from Mother Goose Time) during mine and Tiny B's alone homeschool time, and I'll do the main curriculum with both Tiny B and Strong B. Day 1 was all about streets. 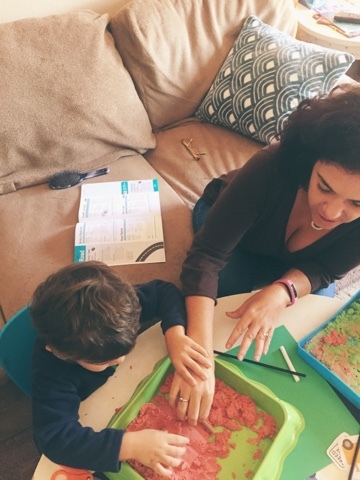 I pulled out my sand and did the first activity, where we discussed how streets are made, made our own streets in the sand, and then made streets and road signs on our own map. 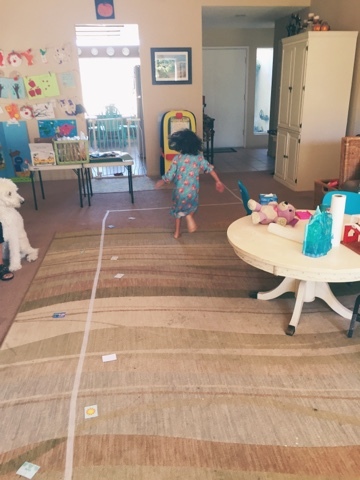 Tiny B was so inspired that she did make believe scenarios with her streets and the bus manipulatives that we received from Mother Goose Time (MGT) two months ago. "Go! Go! Go! Stop!" 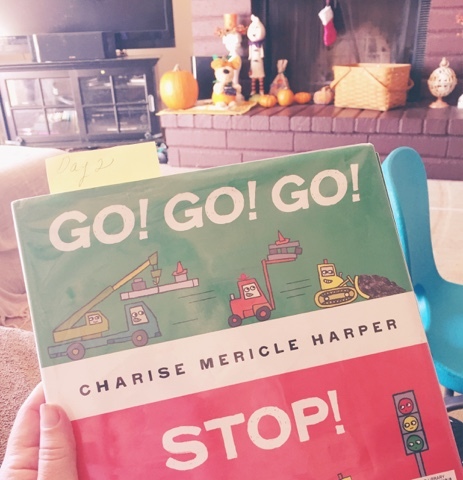 by Charise Mericle Harper was a great book to get us started. 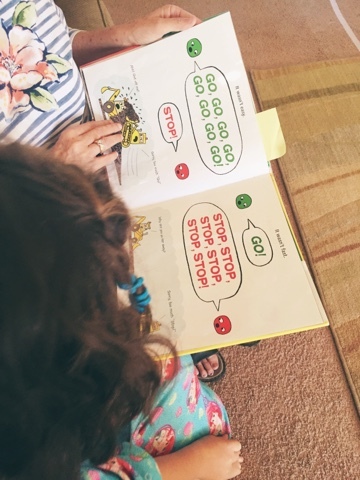 The repeating of words gave Tiny B the confidence to "read" the book. I just love it when she feels empowered like this. 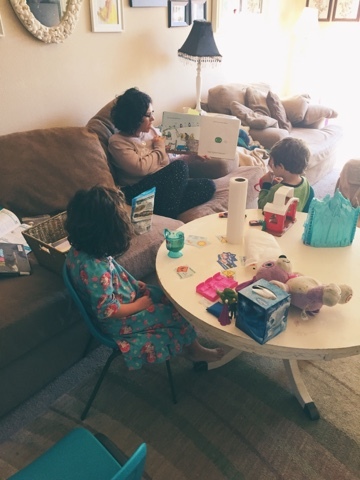 She even read it to grandma. 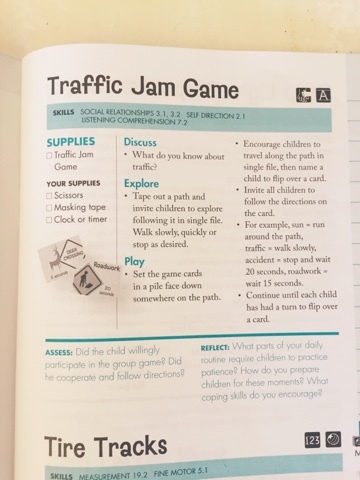 We then played a road traffic game which was so much fun and great for their gross motor skills. 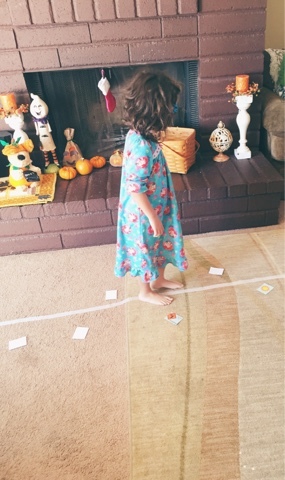 The house became a street and they became the cars, and they took turns flipping over the game cards and doing what the card told them, such as driving fast or getting in a traffic jam. The kiddos had a blast and it was definitely a fantastic start to our new theme! I can't wait to see what the month brings. This picture definitely shows the joy of learning in one's pajamas and doing it in a totally fun way.